I woke up early this morning, enjoying the full luxury of Sunday. For some time I pondered a short story I’ve been writing in my head for probably too long now, stretched comfortably across the length of my supportive pregnant-lady body pillow. When the sun rose high enough to begin scattering through the window my mind moved to more immediate things, primarily breakfast. As Justin is out today hunting the elusive brown trout I had planned on something simple. Scrambled eggs and toast, or a several-day old Scratch Bakery bagel. 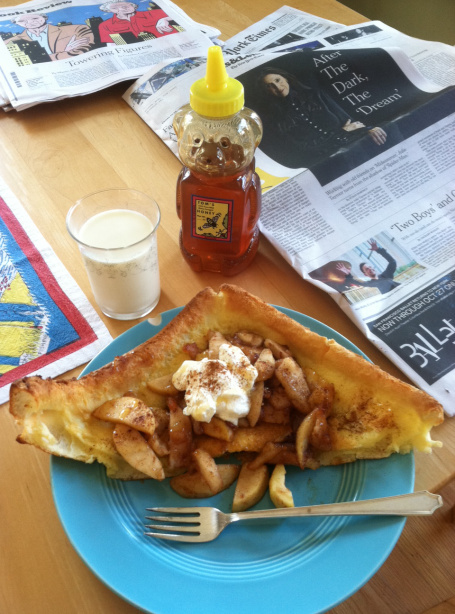 But lying there, luxuriously as I have said, the German Apple Pancake came to mind. Or, to be more accurate, bludgeoned my easily seduced palate to full-attention. After all, rationality kicked in; there were all those apples we had picked at Sewall’s Organic Orchard that weren’t getting any younger. Growing up, German Apple Pancake was a family favorite on Sunday mornings, and one I typically helped my mother prepare. Much in the fashion of “Chicken Tahiti,” another of my childhood favorites, I doubt the pancake is actually German so much as a product of a 1950′s desire for food exoticism. In any case, the recipe was contained in a cookbook that we used for absolutely nothing else, which we finally rid ourselves of by transferring the instructions to a card. It s a simple recipe and perfect for a quick but special weekend breakfast. Essentially a batter of egg, milk, and flour is poured into an oven-hot and buttery baking dish, transforming itself after about 25 minutes into a delight that is puffy and risen on the edges, eggy and dense in the middle. (If you are an eater who revels in texture, this one is for you.) While it bakes, peeled, sliced apples are sautéed with butter, sugar, and cinnamon. Individual portions of “pancake” are topped with apples, and then a dusting of powdered sugar. Everything seemed to be going well with my breakfast until I realized we didn’t have powdered sugar. This was a real blow. I have always felt that the powdered sugar is essential to pulling the thing off. I especially love the kind of glue it forms when bonded with the apple slurry. While my apples sizzled away, I tried to channel Justin, who has always forgone the powdered sugar, stating the argument that the “apples are sweet enough.” This could be true, but for me the dish works upon the logic of three – savory egg pancake, sweet and tart fruit, little touch of powdery, refined decadence. If not powdered sugar, it needed something. As I dished up my serving, I remembered my old friend sour cream. Yes. I didn’t allow myself to think too long or hard about it before whacking a dab of sour cream on top, followed by a few quick slashes of Tom’s Honey. I must say I rather enjoyed it. It called to mind one of the more influential dishes of my youth, berry and cheese blintzes from the old Camden restaurant, Mama & Leenie’s. While I remember the cheese blintz filling to have been a bit like cottage cheese in texture, it had a deliciously sour cream and fresh milk flavor. Wrapped in thin crepes, baked, and topped with what was probably lingenberry preserves, it was one of the most unique things I had tasted, and it often called me and a similarly affected friend downtown after school until the restaurant, sadly, closed. Heat oven to 450 degrees; while it is coming to temperature, put about 2 tablespoons butter in a baking dish (9×9 is ideal for the quantities that follow; increase ingredients for a full-size rectangular baking dish) and heat in warming oven until butter is melted and pan is hot. Whisk together until smooth: 3 large eggs, 3/4 cup milk, 3/4 cup flour, 1/2 teaspoon salt. Pour batter into dish and bake for 15 minutes. If, during that time, the pancake puffs up in the middle, poke it several times with a fork. After the 15 minutes, reduce oven temp to 350 degrees and bake for another 10 minutes. While the pancake is baking, peel and slice as many apples as you would like for topping (about3-4 standard sized apples does the trick). I like a variation of thick and thin, so that some get a bit mushy while others stay whole. In a skillet, heat 2 tablespoons butter and 1/4 cup sugar for a minute before adding apple slices and a healthy dose of cinnamon and nutmeg. Cook to as done as you like. When everything is done, cut pancake into portions, top with apple mixture, and sprinkle withpowdered sugar – or of course with sour cream and a drizzle of honey! Sounds delicious – I’ll have to try to veganize the recipe. Next time just pop over and borrow some powdered sugar!